Japan will use the trip to take up the sale of ShinMaywa US-2 amphibious aircraft that India has been interested in for several years. Japan and India are working on closer defence ties. 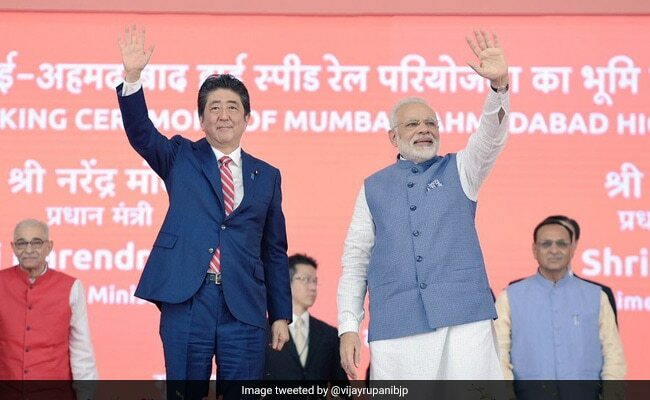 As Prime Minister Narendra Modi hosts his Japanese counterpart Shinzo Abe in Gujarat on a visit designed to highlight the growing cooperation between their countries, Chinese state-run media has predictably lashed out, alleging "the India-Japan intimacy is more like a contrivance" and both "are unlikely to challenge China without giving it a serious thought". Mr Abe was treated to an unprecedented 8-km road-show with PM Modi in Ahmedabad yesterday on his arrival. This morning, they launched the $17 billion project that will give India its first bullet train. With a top speed of 320 kms per hour, the train will connect the two trading centres of Ahmedabad and Mumbai in a two-hour journey. This is the 10th meeting between PM Modi and Mr Abe in the past three years. Japan and India are working on closer defence ties as part of the strategy to counter China's growing regional influence. The aircraft is expected to boost India's maritime capabilities. Last year, China had angrily reacted to the prospective sale of these aircraft to India. An op-ed in the state-run Global Times in Beijing said "Closer India-Japan ties won't pose grave threats to China because many of their emotional moves to console each other won't produce any real effects in challenging China." It said China would never follow India and Japan "who have somewhat lost themselves". The Japanese leader's visit to India comes just after a lengthy standoff between Indian and Chinese soldiers near the Sikkim border in a strategically key area. The newspaper said after the conflict, Indian experts and media have emphasised the need to forge deeper ties with the US and Japan to counter China. "They want to encourage themselves by calling for India's alliance with the US and Japan to showcase India's strategic potential to China. This suits the desperate needs of Indian society's mentality," said the Global Times, a nationalist tabloid.